Last night was the annual pumpkin walk in our town. Walk along the path lit with freshly carved spooky jack-o-lanterns. Unfortunately, we were unable to participate in the actual pumpkin carving this year but we enjoyed seeing everyone else's creations. 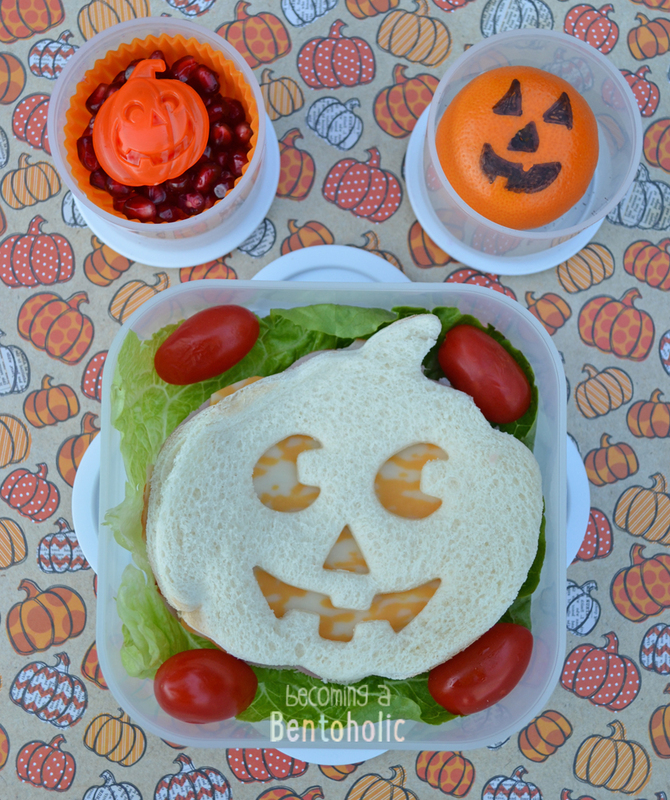 I did, however, manage to make a fun jack-o-lantern sandwich. In this lunch: pomegranate arils, clementine with a jack-o-lantern face drawn on with a sharpie, a jack-o-lantern cookie tucked under the clementine, grape tomatoes, and a ham & cheese jack-o-lantern sandwich on top of a bed of lettuce. This lunch was packed in our yubo complete with Halloween faceplates.